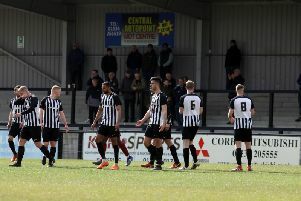 Steve Kinniburgh admitted he was “not best pleased” despite Corby Town producing a superb fightback to earn an Emirates FA Cup preliminary round replay with Dunstable Town. The Steelmen’s woes in the world’s most famous club knockout competition looked like they were going to continue as they found themselves 3-0 down to their Evo-Stik South League Division One Central rivals at half-time. But Corby hit back after the break with a Joel Carta penalty and further goals from Jordan Francis and Elliot Sandy sealed a 3-3 draw as the visitors finished with nine men. The replay will be at Dunstable on Tuesday, September 4 by which time the two clubs will know what awaits the winners in the first qualifying round. And while the Steelmen boss was pleased to see his team still in the hat, he was far from impressed with their first-half display. “We are still in the hat which is the most important thing,” Kinniburgh said. “We had chances to kill the game off in the first half before they scored but the defending and the shape for that 15 minutes was abysmal, there is no other word for it. “If your kids at school were doing that you would be embarrassed, I don’t know what happened. “But we regrouped at half-time and we managed to come out and give a performance that I think a lot of people knew we had. “We got the early goal from the penalty and we had chance-after-chance and we took two of them to get the replay. “It was a game of chances and it was far too open for my liking. “We were giving away too many cheap goals last year and we did it again. We were much better defensively in the first two league games and then we have taken a step back. Corby will now bid to maintain their unbeaten start to the season in the second part of their bank holiday double-header when they return to league action at Coleshill Town tomorrow (3pm). Coleshill have won two out of two so far and Kinniburgh added: “We have got to recover the bodies and get ourselves going for the league. “There is no point in dwelling at this stage of the season with the games coming thick and fast. “We have a game against a team who have won two out of two so it’s really tough. “It’s on the 3G pitch which changes the dynamics and we will have to look at that. “If we defend better like we have done in the other two games, we know we have what we did in the second half on Saturday in our locker. The Steelmen will have Greg Ling, who was cup-tied, and Jamie Anton, who was unavailable for personal reasons, back for tomorrow’s clash but Ben Bradshaw is a doubt due to a foot injury.